Trail description: Not for the faint hearted. This steep climb takes you to a variety of spectacular views and stunning central fells of the Lake District, with plenty of resting points and picnic sites. 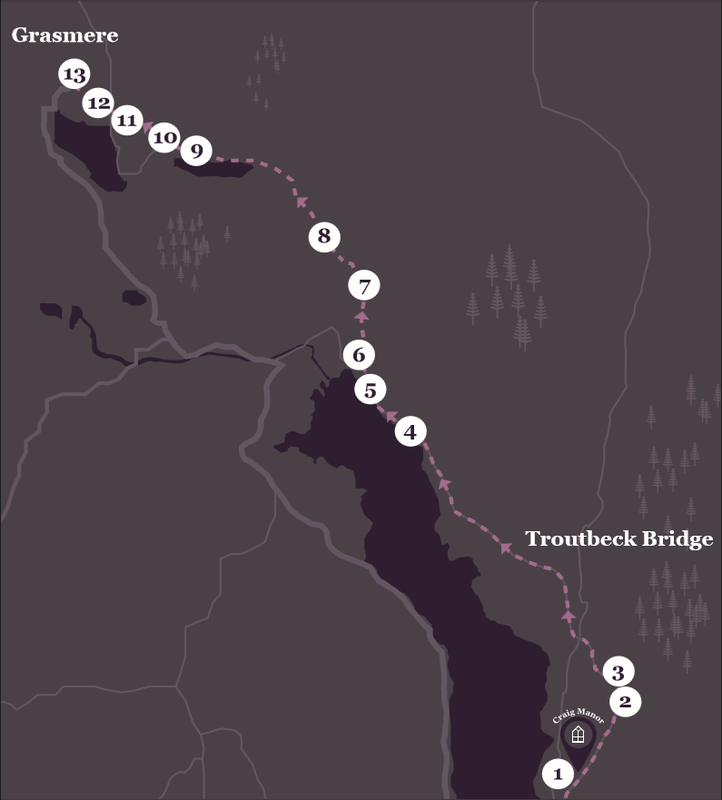 Trail Notes: The circuit of Windermere to Grasmere, passing England’s longest and largest natural lake, can be done in stages. The route keeps you close to the lake, passing the Grasmere village towards the end, with rewards of beautiful viewpoints along the way. 1) Upon leaving Craig Manor turn left in a northeast direction along Lake Road. Keeping tight to the pavement, make your way out of the town along the winding roads before reaching Ellerthwaite Square. This perfect pit stop is brimming with public attractions, coffee shops, retailers and cafes to leave you refreshed and ready for your walk. 2) Keep left at the traffic lights and past several village landmarks, including a signposted Methodist Church to your left. The path reaches a junction to a busy main road and the footpath levels out. 3) At the end of this road, turn left onto Church Street. From the junction take the narrow path up towards Keswick (A591) to the viewing station. This longer and much steeper climb will lead towards your destination. 4) If you are looking for a rest, there are benches a little further upstream where you can admire the delightful views of Lake Windermere with ease. After taking in the sights, relaxing and enjoying the peaceful surroundings of the riverside, continue uphill towards Ambleside. 5) The entrance to Ambleside is marked by a signpost on the left of the roadside. Pass through the village centre where you have the chance for another pit stop. There is little traffic on the country roads so care will be needed where it narrows and on corners. There are some good glimpses of the view back down the lake and to the fells on the other side. 6) Continue up the main road towards a lakeside car park and, where the path forks, take the right fork making your way up the gentle incline. The path passes out of sight of the lake behind some trees, then around a few more bends before you get a rewarding view of the mountains rising above the valley. 7) At a T junction turn left along Rydal Road to walk alongside the bustling market town. The square is much bigger and has a wealth of gear shops and eating establishments. It can get overcrowded a at peak times, so keep tight to the pavement as you make your way through this popular lakeside town. 8) Pass through the centre towards a roundabout, where you should continue straight along a narrow road following signs to the A591. After some distance, the bustling town centre transforms into a beautiful lakeside excursion for a more relaxed pace. The stunning views across River Rothay at the end of the path come as a welcome surprise as you continue along the lakeside. 9) The path gradually swings to the right as you start to climb further towards Grasmere. This route is slightly more satisfying, with a shorter five minute walk towards your next turning point. 10) Be sure to keep a look out for a brown sign marked White Moss Walks, as you might walk past your turning point. Turn right here following the marked route up a woodland path leading to Grasmere. It is narrow and relatively rough here with steep drops off the path although not a great distance. 11) Follow the winding path deep into the woodland until you reach a left turn. Take the turn following the track along to the road side, ending at Dove Cottage (see points of interest). 12) Here you should take a right turn to meet a roundabout, where you should take the first turn onto Stock Lane. This final section of the walk takes you past the countryside streets and into the Grasmere village where you can see the grave of William Wordsworth in the peaceful graveyard of St Oswald’s church. 13) When you’re ready to return, retrace your steps back to the hotel for a well-deserved cup of tea and a rest in our luxury hotel rooms. Explore the traditional Lakeland cottage and home of the most famous poet William Wordsworth and discover what life was like in this charming village in the 19th century. Settling in the countryside in the heart of the native mountains’ meant that Wordsworth was both inspired and productive. Step inside for a guided tour: stone floors, panelled rooms, roaring coal fires and the family’s belongings still in place.